My dad used to work at North American Aviation. So periodically, we would head down to their recreation center and check out the various clubs and what not showing off their various skill sets. I was fascinated by the rack mounted amplifier and the tower next to the W6UUI club station. So, some time in 1967 I managed to find someone to give me the NOVICE test and I waited paitently for the ticket to arrive in the mail. After the license arrived in the mail, my dad took me down to Henry Radio when they were adjacent to the 405 freeway on Olympic. We came home with a used Hammarlund HQ-110 receiver, a Heathkit DX-20 transmitter, and a trap vertical antenna, 4-BTV. Several friends came over to help raise the antenna, and to this day I'm still amazed no one was killed since we erected it adjacent to the local power lines in the back yard. The big moment had arrived. Time to get on the air. Nothing. I was scared to death. After a couple of months my dad even threatened to take everything back to the store if I didn't "use it." My 1st Elmer, came over to the house and made sure everything was set up properly and sat there as I nervously answered a CQ on 40 meters. The ice had been broken. Finally, now I was a "real ham" and had made my first contact. I sent off and waited for my QSL cards to arrive. Bright red with WN6FWI emblazoned on the front. Meanwhile, I put up a 40 meter dipole as I had learned that the trapped vertical seemed to work equally poor in all directions. After I had worked and gotten about 50 QSL cards back from other novices, I decided to see where they all were. It was funny, all 50 of them were in a perfectly straight line up and down central California in line with the dipole. Perhaps I should face it in another direction. One of the people I'd met on the air took the time to help me improve my code speed and get my technical knowledge up for a license upgrade. 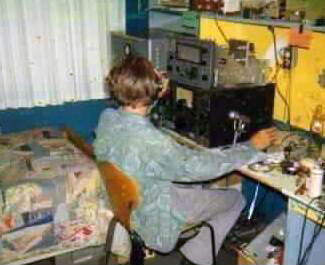 While I was at it, I managed to get my buddy down the street involved in Amateur radio as well. Every night we would get on the air and carry on until one of our parents came along and threatened us with "great bodily harm" if we didn't go to bed. My "upgrade" Elmer even bought me a ARC-5 receiver and showed me how to make it work with the Hammarlund to improve the selectivity. The next big hurdle awaited. My buddy and I got a ride to down town Los Angeles and promptly failed the upgrade test. But we didn't go away empty handed, we both got a jaywalking ticket for crossing the street when we realized we had the wrong building for the test. One my second try, I passed the 13 WPM code test, took the General test, and as I passed that, they asked, "Why not take the Advanced while you're here." I passed that too. Again, time to sit at home and nervously await for the license to arrive in the mail. Shortly after I got that one the air, I added another accomplishment to my list. I got my first Notice of Violation from the FCC. I was in QSO with my 2nd Elmer and a friend of his, and we kept moving down the band trying to find a quiet spot. Well we did. It was in the Extra portion of the band. I would like to add that was not only my first, but ONLY Notice I'd ever gotten from the FCC. And in honor of that, he presented me with a brand new Vibroplex original. So here we are 40+ years down the road, and still licensed and occasionally on the air when I have time for it. Of all the stuff I've gotten rid of over the years,I still have my bug. In the words of Jerry Garcia, "What a long strange trip it's been." And a special thank you to Roland Peebles, AA6CO (ex WB6BPL) My first Elmer. Richard Krekemeyer, WA6FID who made noise at the club station while we were trying to practice code "They need to learn to deal with QRM", Wolf Dryja, DL7JY who instilled in me the appreciation of "big iron" transmitters. 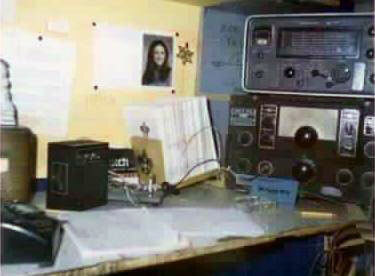 Dave Mills, AJ7O (ex W6FTQ) My 2nd Elmer and who got me employed in additional to upgrading my license. And of course my buddy Roy Miller, AE6PU (ex WB6GLT).